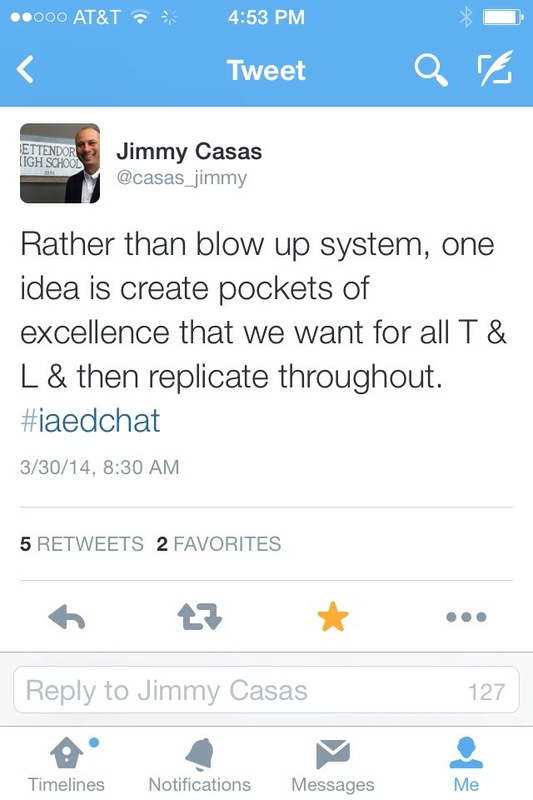 This tweet from @casas_jimmy is brilliant! We have all struggled with colleagues who are scared or reluctant to change… And many of us have struggled with making big changes. Jimmy’s advice says it all! Everything doesn’t have to change at once, identify a piece that would really make a difference and start by encouraging that of our teachers and learners! What would that piece be for you? Would you/your colleagues be willing to tackle mini goals throughout the year!? This makes me think of our First Friday meetings here in Anchorage. Together, we decide what we want to learn and apply, then we work through the kinks together. The success that comes from taking the journey together naturally draws in the teachers in our spheres of influence and creates a huge ripple effect of change! Michele Whaley is the best.